DRM advocates tend to argue that they add anti-piracy protection to keep users honest with paying for the software or product. Machinarium is an amazing point and click adventure game playable on Windows, Mac or Linux. In an effort to prove a point, Machinarium developers – Amanita Design from Czech released the game without any DRM restrictions. You can install the game without any serial numbers or online authentication. This makes the game so easy to copy and be pirated. Sadly, the game developer is saying that Machinarium has only 5-15% of players who actually paid for the game. Amanita Design in an attempt to give a second chance for those 85-95% of players who haven’t paid for the game has announced a ‘Pirate Amnesty’ sale. 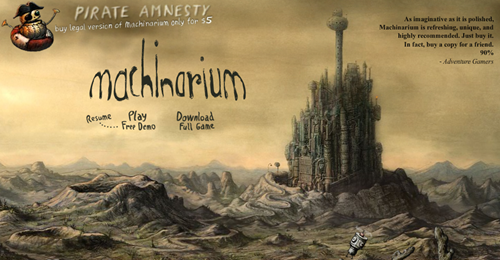 Machinarium and its soundtrack is available for a mere $5 with 75% off from its original price of $20 until August 12. They are hoping the game pirates will make amends buy purchasing it at this low price. However, this amnesty sale doesn’t apply to just who already have a copy but also to anyone interested in this game. I played the online free demo and was totally amazed by the creativity behind this point and click adventure game. $5 for such an amazing experience is nothing, IMHO. Machinarium game does not want their customers to be suspected of stealing the product. The game company behind this is doing the right thing for not punishing their customers. i hope that other game companies will company their anti DRM stance. Brilliant information depicts in this article. Very useful ideas. I try to apply on my website. Such an impressive post, looks a best insights about sale expertise.